The editors and staff of Tidepools Magazine are excited to announce that the 55th edition contest is now open for submissions. 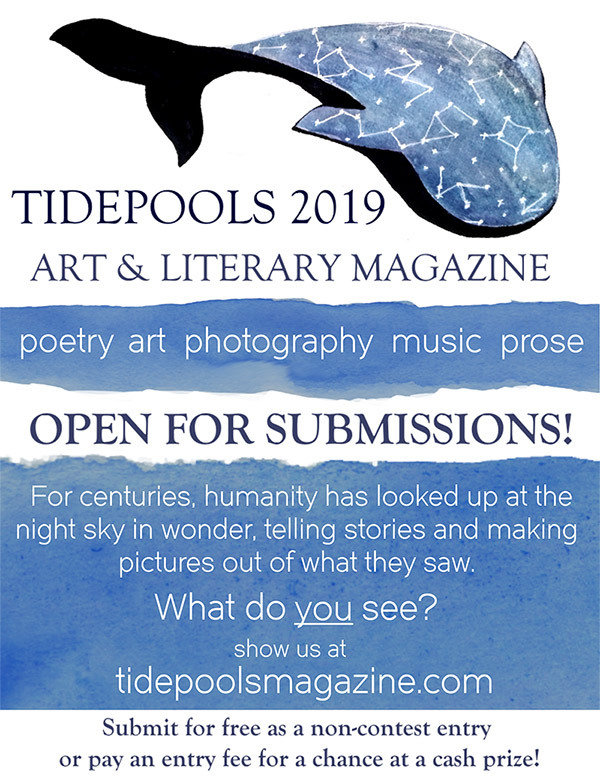 Tidepools, a production of Peninsula College in conjunction with the Peninsula Daily News and The Buccaneer, will feature the following categories: Fine and digital art, photography, poetry, short prose and music, all of which will be submitted by residents of the North Olympic Peninsula. The contest is now officially open for residents of all ages from Jefferson and Clallam Counties. The contest deadline is January 11, 2019. Winners will be announced by March 15, 2019. For rules, submission methods, and general information, please visit our website at www.TidepoolsMagazine.com. Stay up-to-date by “liking” us on Facebook at https://www.facebook.com/Tidepools.Magazine .